If you don’t know what to do, check our promotion page for all of the details! Protect your little one’s skin from their own finger nails. Use the clue above to find where this icon (shown below) is hidden on Mom 4 Life and you could win. 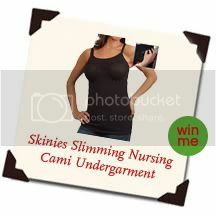 . .
a Skinies Slimming Open Cup Nursing Cami in your choice of style! Also, today only, get The Diaper Clutch for 20% off! And don’t forget to take advantage of. . . The post Day 4 of the 12 Days of Christmas appeared first on Mom4Life Blog.